Stuff each date with a Parmesan stick. Wrap each stuffed date with bacon and secure with a toothpick. Set up your grill for indirect grilling and preheat to medium heat (350°F to 450ºF degrees). If using a gas grill, place all the wood chips or chunks in the smoker box or in an aluminum pouch and run the grill on high until you see smoke; then reduce the heat to medium. If using a charcoal grill, place a large drip pan on one side of the charcoal grate and the lit charcoals on the other side, preheat the grill to medium, and then toss all of the wood chips or chunks on the coals. Place the dates over the drip pan on the opposite side of the heat and cover the grill, placing the vents over the dates. This helps to draw the smoke through the food for flavor. Cook the dates until the bacon is fully cooked, about 30 to 40 minutes. 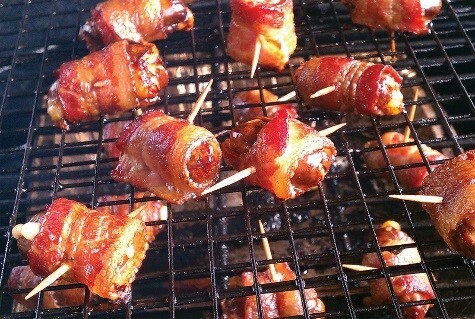 Remove the bacon-wrapped dates from the grill and immediately dust with brown sugar. Toss to distribute the sugar evenly.